The pickup: The Culinate backyard sports a gazebo, a holly bush, a very dead fir tree, and a very alive Italian plum tree. Seldom (if ever) pruned, this last bit of greenery is currently sagging under the weight of hundreds of plums. The small fruits are chalky until you pick one, rub the bloom away, and eat the fruit underneath: bluish-purple on the outside, greenish-yellow on the inside. We've been watching the fruit for weeks now, waiting for the plums to transition from slightly too firm and tart to just soft enough and sweet. Impatient, we decided to hurry the poky plums along with the aid of refined sugar and an oven. The results: Everybody and every book, it seems, has a recipe for plum cake. 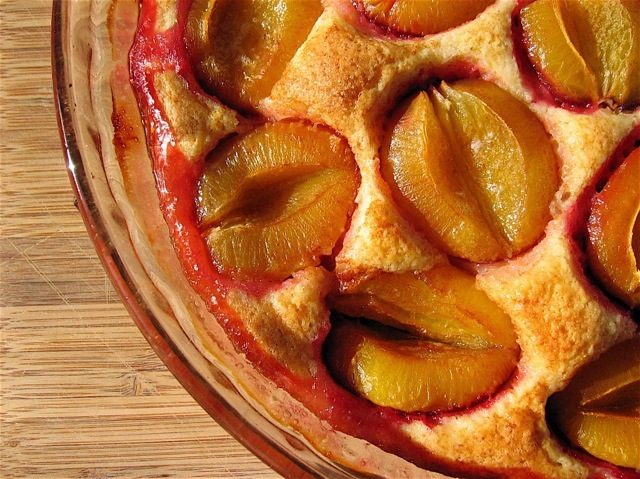 Most are variations on the arrange-plums-in-a-batter dish; the batter bakes up around the plums and makes colorful patterns. We tried a recipe from the current issue of Martha Stewart Living and one from a friend's mom. The verdict? The Martha cake was both prettier and easier to whip up, but the friend cake was (thanks to all the extra butter involved) sweeter and richer. So, if you happen to have a loaded plum tree nearby, pick a few armfuls and freeze some. Bake the first cake now, for a lighter (and faster) summer dessert. Then come fall, bake the second cake for a denser, more autumnal treat.